What I wore; Party Time! This is what I wore to my grandpa’s 80th birthday surprise party last weekend. I tried to pick out something at least moderately conservative (read: tattoos covered) Some days you just don’t feel like talking about them, especially with all your great aunts who don’t have filters from their brains to their mouths. The party was great, my grandpa was totally surprised and had a blast! He can’t stop talking about it! Before the party I had a few hours to waste, so we headed to the cemetery. I figured there would be somewhere in there pretty to take outfit photos. Plus it was a beautiful day and I love exploring cemeteries! I love looking at all the old headstones, calculating how old they were, and imagining what they were like. Lets not forget what awesome names everyone had, so strong and powerful – I’m pretty jealous! I took a bunch of photos but afterwards realized I’d be much happier if the photos were film, not digital! I guess that just means we’ll have to go back again! That tooth pin is adorable! I almost had the "I need to start dressing like a grown up" mental talk with myself yesterday, but then realized Khaki is a lame color, and if I want to wear rainbow for the rest of my life why the heck not?! I'll make one bright and chipper old lady! I loooove this outfit! I am obessed with all things mint and I love it paired with brown! 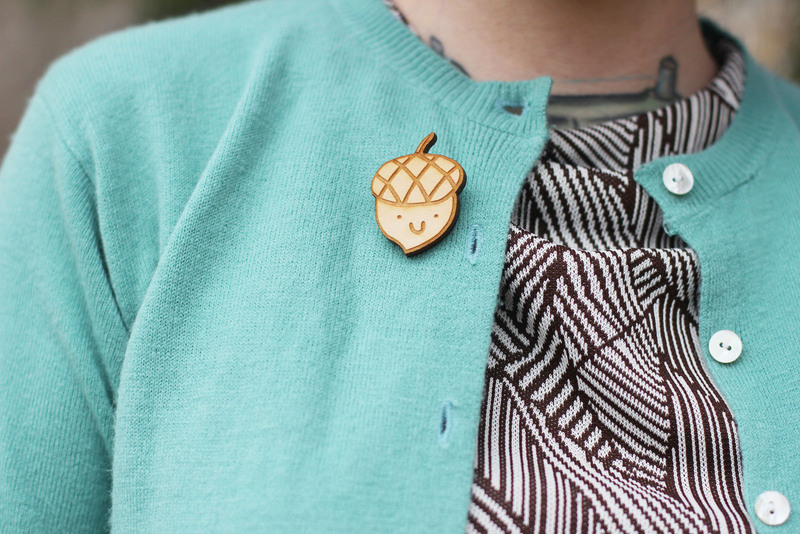 Your acorn pin is just too stinkin cute and I totally agree about cemeteries! I love strolling through old ones and thinking about what their lives must have been like! Love this tooth pin, it is the cutest thing. 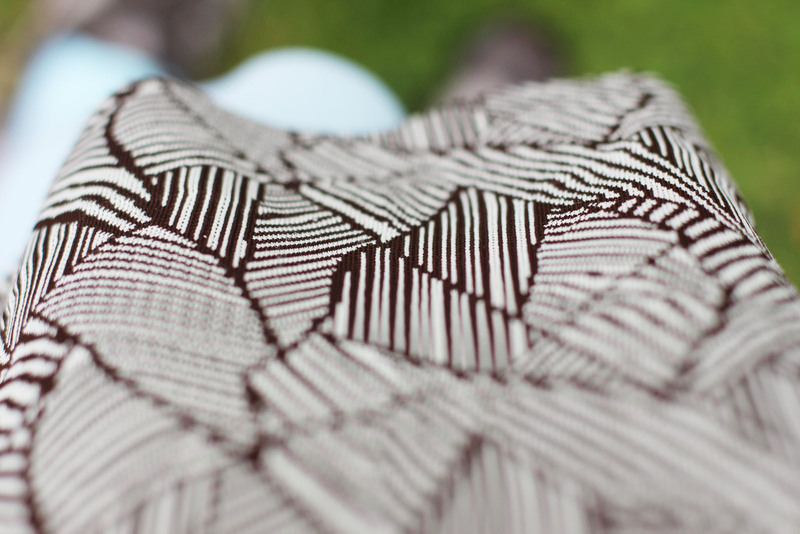 The pattern on your skirt & shirt are just awesome as well. Also I do the same 'cover up the tattoos' thing at family gatherings. And I only have 2, I just don't want to discuss 'why I would do that to myself'. you are so adorable! these are some of the prettiest outfit photos ever! the lighting is just so lovely. I love cemeteries, I love looking at the old headstones and seeing how old they were and reading what their family had to say about them! 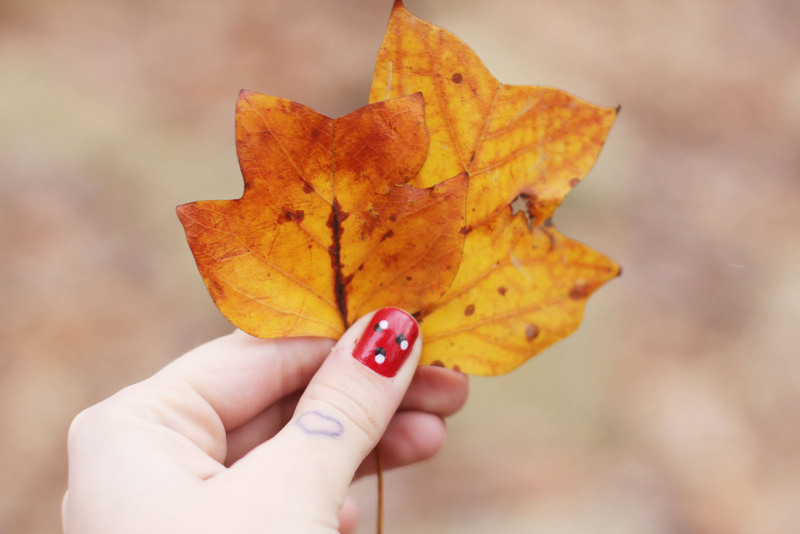 Your blog is really, really lovely and is one of my favorite! 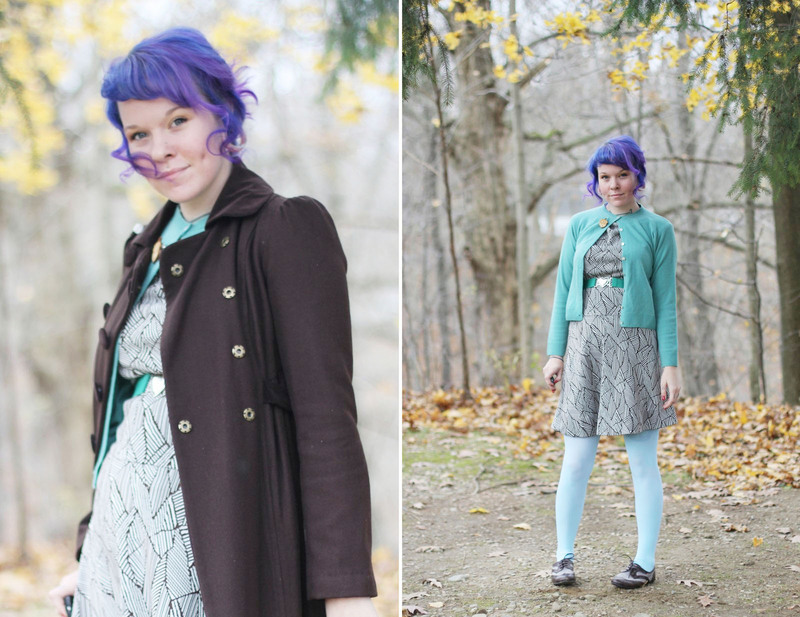 You really picked a perfect grandma-party appropriate outfit without sacrificing any of your adorable style! LOVE the pattern of your dress. Beautiful! lovelovelove! cute with and without the coat. and look at you having the thought to add pins to your ensemble. Aww, the surprise party for your grandpa sounds like it was really fun!! love them and those tights are so cute. That coat is way too cute! And your hair looks awesome up and curly too! You're the cutest, Kaylah. I always love your outfit posts! I love the Acorn pin !!! I love this outfit it is so adorable. I especially love the tights! You've convinced me I need to go and buy from We Love Colours! 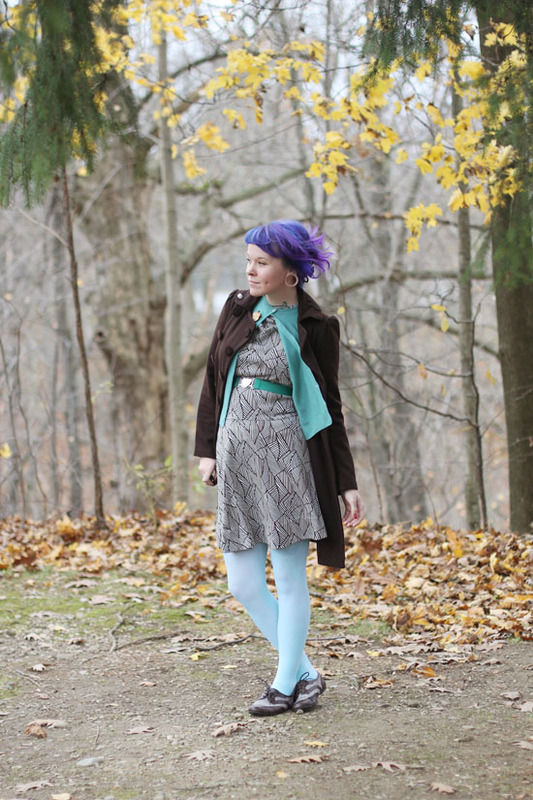 Oh, I absolutely ADORE your minty blue tights! You look precious! Happy birthday to your grandpa, too…80 years is certainly something to celebrate! That dress is a super duper find! your outfit is exceptional! that blue green color looks terrific on you. i like the pattern of your dress, & your lady bug nails. i find cemeteries peaceful. i like to make up stories & imagine the lives the people lived. Looking awesome 🙂 The acorn and tooth brooches are too sweet! I think the owners of the coolest surname I've come across in a cemetary were Mr and Mrs Careless. I am going crazy over your skirt and shirt set! As I was scrolling down, I actually got pretty upset that you snagged it from an estate sale – otherwise I was going to go and buy one myself! This is such a cute outfit! Your hair looks amazing! Oh this outfit is gorgeous! I love the colours so much, it's nice to see you in blue/teal! 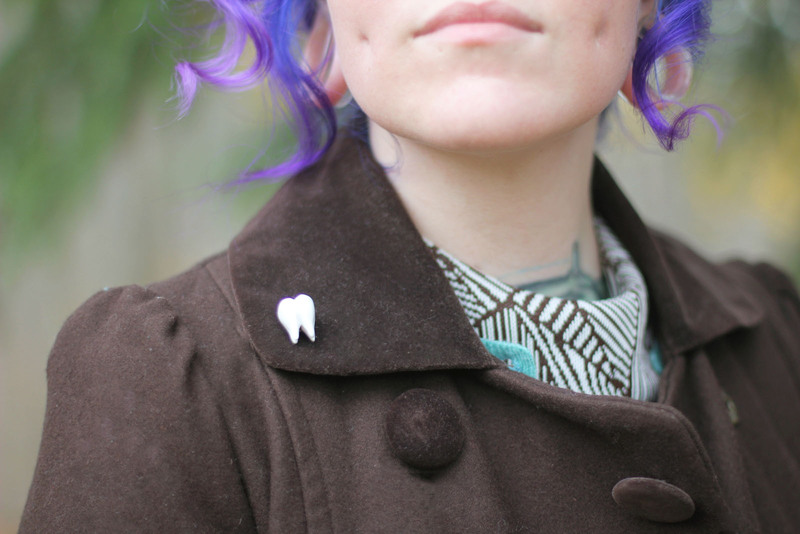 The tooth pin is all sorts of adorable! I love the acorn pin. You are cooool! Your tooth and acorn are just too cute! !